June 1987, and the UK goes barmy for Star Trekkin’, a single celebrating all that was great (and stereotypical) about the classic Star Trek series – i.e. the series with Captain Kirk and Spock. No Trek cliche was left unused, except perhaps the one about Kirk always kissing the pretty female guest character. The song knocked Whitney Houston’s I Wanna Dance With Somebody off the top of the charts (thank God) although it was only at number one for two weeks (also thank God!). The song can be credited to a group called The Firm, though confusingly there have been three bands with the same name including a rock band formed in 1984 and a hip hop group – well, sort of, the full band name appears to have been Nas, Foxy Brown, AZ, and Nature Present The Firm: The Album. Anyway, the “The Firm” that was responsible for Star Trekkin’ were also responsible for another TV programme related novelty song, Arthur Daley E’s Alright, based of course on Minder. Uhura: There’s Klingons on the starboard bow! Spock: It’s life Jim, but not as we know it. Dr. McCoy: It’s worse than that he’s dead Jim. Kirk: We come in peace, shoot to kill. Scotty: Ye cannae change the laws ae physics. Star Trekkin’, across the universe. Boldy going forward ‘cos we can’t find reverse. 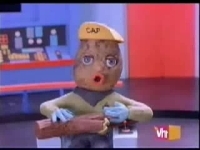 The song is accompanied with a superbly poor video, with the Star Trek characters depicted as singing potatoes on a beautifully crafted model of the Enterprise bridge. Meanwhile we were treated to several badly lip synched (they basically didn’t even bother at all) aliens, which were little more that glove puppets made from socks, or so it would appear, sticking out of craters on a lunar surface singing along to the chorus. This entry is filed under Music - Songs	and was posted on March 14th, 2008. You can follow any responses to this entry through the RSS 2.0 feed. You can leave a response, or trackback from your own site.